There are certain phrases on social media that we need to stop using. ‘What did I just watch! ?’ is one such phrase: clearly you just watched something that made you WTF but you lack the ability to add to the conversation so resort to cliché. Another such phrase is ‘not all heroes wear capes’. Again, ugh… clearly! The Flash; Wonder Woman; The Hulk; Iron Man; Captain America; Black Widow; Professor X. Need I go on…?!? Don’t worry, this rant is relevant (albeit a long time coming). You see, A Modern Guide To Heroism & Sidekickery manages to thankfully take both these clichés and throws them out the window. What did I just watch? A bloody well written gem that manages to be both silly and serious while playing across multiple forms like comedy and circus. Do all heroes wear capes? No, star of the show The Shadow certainly doesn’t, and when they do, they quickly discard it, realising the redundancy of such costuming. Hell, The Shadow even finds lycra a ridiculous superhero costume. Women need pockets too people! 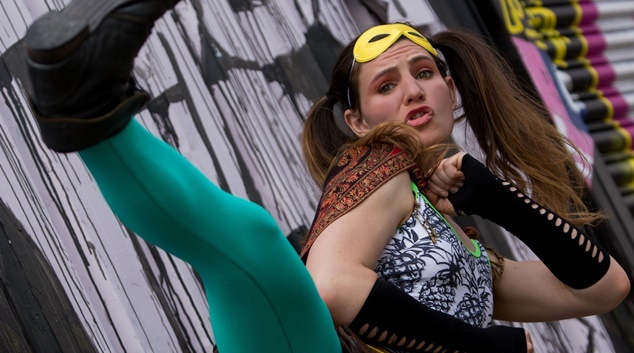 A Modern Guide To Heroism & Sidekickery explores what happens when a girl decides to be brave. Michelle Zahner is that girl, telling us how, as The Shadow, she saves New City from the pigeons. A bizarre premise, but if you stick with it, the show is actually very rewarding. When Zahner becomes Karl, we understand how a sidekick can elevate and hamper a hero. The relationship between the pair becomes tense as they both vie for the spotlight. What follows is tomfoolery, moments of campiness and beauty and some beautiful spoken word. This production could have potentially benefited from a head mic. While Zahner’s voice does fill The Gold Digger admirably, there are moments when the space consumes the narrative, allowing the audience to slip out. A head mic would assure Zahner was present in everyone’s ears as she bounds across the stage because, at times, the wheels of this show were potentially a little squeaky. They didn’t fall off, but they did squeak… yet the squeak did have a quirky, make-and-do air about it. However, the disarming charm and saving grace of this show is the writing. Swoon… if this show’s writing was a superhero I would intentionally get myself into dangerous situations just so it could save me. Great attention has been paid to the narrative, to the tying up of plot points. Zahner’s words have a matter-of-fact poeticism to them: they captivate the mind, lift you up, play with imagery and metaphor in a most delightful manner. Her descriptions of being ordinary are so powerful you can tell they come from an honest place. And yet Zahner transforms the ordinary into something extraordinary, all via language. The superhero franchise is one bereft with cliché. Yet this show with a charming and inordinately long title manages to make something fresh out of the superhero genre. More than that, this show is thoroughly endearing and incredibly aware and sensitive toward those of us who fear we are slipping away into banal ordinariness. You aren’t. You have the ability to be brave. Just leap. Have faith. Or kick a tile off a roof. Now, when people ask ‘what did I just watch? !’, after watching this show you can simply reply ‘something sweet and very very brave’.